Daimler blocked sales of the Shuanghuan Bubble, pictured, claiming the car was a Smart ForTwo clone. Italian distributor Martin Motors says it will sell a slightly tweaked Bubble in Europe. The changes include a spare wheel on the rear and roofrails. The car starts at 9,900 euros (about $13,340) in Italy. BOLOGNA, Italy – Italy has not been fertile territory for China's automotive brands. Although upstart Italian distributors were among the quickest in Europe to debut the brands, Chinese automakers generated just 0.3 percent of Italy's total sales through October. Stated another way, 3 out of 1,000 Italian car buyers have purchased a Chinese vehicle so far this year. On a positive note, 10-month sales of Chinese brands in the country rose 16 percent to 5,353 units, but that is not an encouraging result for carmakers such as Great Wall Motor Co., which debuted in Italy five years ago. Great Wall's Italian importer, Eurasia Motor Company S.p.A., introduced the brand in 2006 and hoped to sell as many as 12,000 units annually after three years. In 2009, Eurasia sold just 1,785 units. This year, it doesn't expect to do any better. The importer is selling the Hover SUV and Steed pickup, but it needs passenger cars, said Eurasia Chairman Guido Ognissanti. “We really hope we will get the Voleex (subcompact hatchback) sometimes next year,” Ognissanti said earlier this month. Great Wall plans to start exporting the Voleex to Italy in the first half of next year, according to a report this week in Automotive News Europe sister publication Automotive News China. Later, Great Wall will launch sales of locally assembled Voleex cars in Bulgaria, said Roger Gao, manager of the company's international branding department. 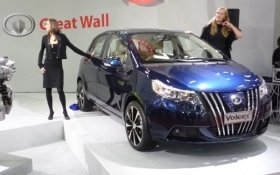 Great Wall's assembly plant in Lovech, Bulgaria, is slated to begin production in the first half of 2011. Initially, the Lovech plant will produce only for the Bulgarian market. Eurasia boss Ognissanti said that it is hard for an importer to make plans with a carmaker which, distracted by a buoyant domestic market, frequently revises its export plans. Pricing also is an open issue, he says. “Great Wall asks us our potential sales volume before setting the price, but could we forecast a realistic volume if we were not told the exact price?” Ognissanti said. In 2006, Great Wall promised its Italian distributor that it would quickly add passenger cars to a lineup featuring SUVs and pickups. That didn't happen. 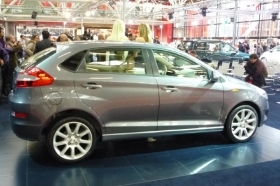 The Voleex subcompact is expected to go on sale in the country in early 2011. A starting price has not been revealed. Ford of Italy CEO Gaetano Thorel said: “Italians are brand-centric consumers and Chinese automakers so far do not have a credible brand story to tell." Thorel is convinced that lesser-known brands such as Skoda and Dacia successfully lured Italian buyers because their corporate parents – Volkswagen AG and Renault SA – were trusted brands. “Without the brand heritage of their parent companies, Skoda and Dacia would have remained minimal players here,” Thorel said. From January through October, Dacia's Italian sales totaled 21,017 units for a 1.2 percent market share. Skoda sales rose nearly 8 percent to 13,838 units for a 0.8 percent market share. Dacia and Skoda grew despite a weak Italian market that declined 8 percent to 1.8 million units, according to Transport Ministry data. Italian car retail entrepreneurs have been among the most active in Europe in trying to market China-built cars, but the Chinese brands have failed to attract the country's best dealerships. Great Wall has 80 dealerships in Italy, while DR Motor has 91 and plans to reach 100 stores by the end of 2011. Those networks are not undersized, compared with rival brands. For example, Ford has 125 dealers in Italy, while the Fiat brand – which controls a quarter of the country's new-car sales – counts on 285 dealers. The problem is that stores that carry Chinese brands tend to be small, family-owned dealerships. Big dealer groups say they haven't been approached by Chinese brands. “For years, I had been open to add Chinese automakers to my brand portfolio, but none of their distributors ever contacted me,” said Francesco Maldarizzi, who heads the Millenia Group. Millenia, whose annual revenues total 150 million euros ($202 million), sells Fiat, Lancia, Mercedes-Benz and Opel models in south and central Italy. The Miranda Group, a major Naples-based retailer that represents Fiat, Ford and VW, was never contacted either. But sales director Francesco De Carolis said this could be the right time to look for a Chinese brand franchise. “A minicar such as the Bubble, priced below 10,000 euros, could be a hit in the Naples area and I am really interested in getting it,” De Carolis said. Italian distributors of Chinese cars often set optimistic sales targets, only to fall short. DR Motor Co. S.p.A., part of the Di Risio dealer group, imports and sells Chinese vehicles as a domestic brand. Most of its cars come from Chery Automobile Co.
“The market collapse had an effect on our original plans, but we hope we can continue to grow because the consumer is more cautious and we offer true value for money,” DR Motor Chairman Massimo Di Risio said. Italian distributor DR Motor has high hopes for the DR3 compact hatchback, which will go on sale next year with a starting price below 11,000 euros ($14,820). With sales of 4,128 units through November, DR Motor has nearly doubled its year-ago sales. But the gain is modest compared with its original expectation to sell 12,000 medium SUVs in the first 12 months after their 2007 introduction. Di Risio predicts DR Motor will sell 5,000 units this year, doubling last year's sales of 2,454 units. Di Risio also expects revenues to rise 30 percent this year to 50 million euros. With sales of 4,128 units through November, DR Motor has indeed nearly doubled its year-ago sales. But this is a modest result compared with original expectations. When it introduced its Chinese lineup in 2006, DR Motor forecast sales of 12,000 medium SUVs in the first 12 months alone. But it hasn't had much luck with SUVs. Katay, a brand created by DR Motor to market SUVs and pickups made by Zhejiang Gonow Automobile, has disappeared. Gonow subsequently found a new distributor, Rome-based Gonow Europe S.r.l. Other distributors of Chinese brands are struggling, too. Two years ago, Martin Motors began distributing the Shuanghuan CEO – a near-clone of the BMW X5 – and also some passenger cars from Lifan, but it sold only few dozen units. Now Martin is selling the Bubble, a 3300mm-long (130-inch-long) four-seat minicar that starts at 9,900 euros. Built by Shuanghuan Automobile Co., the Bubble was supposed to debut at the Bologna auto show in 2007. 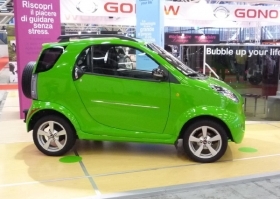 But Daimler AG sued to block its sale, claiming the car was a clone of the Smart ForTwo. After a legal battle, Martin Motors says it is allowed to sell a slightly tweaked Bubble in Europe. Martin Motors Marketing Director Viviana Martinelli regrets the legal battle that blocked the Bubble's launch in 2008, when it could have enjoyed healthy sales. At the time, Italy offered a 2,000-euro scrappage bonus for vehicles that ran on liquefied petroleum gas, a fuel system the company had planned to offer as standard equipment on the Bubble.